When facing one of the biggest challenges of your career, it’s good to have friends in the right places. 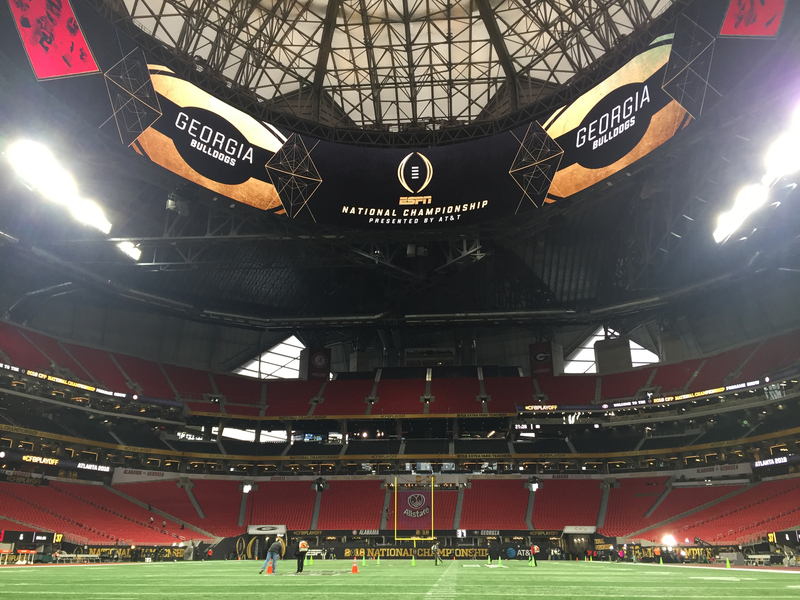 At the College Football Playoff National Championship Game, Van Wagner Sports and Entertainment (VWSE) annually steps in to produce the in-venue videoboard show. That calls for a collaborative effort between VWSE and the home stadium’s video-production team. 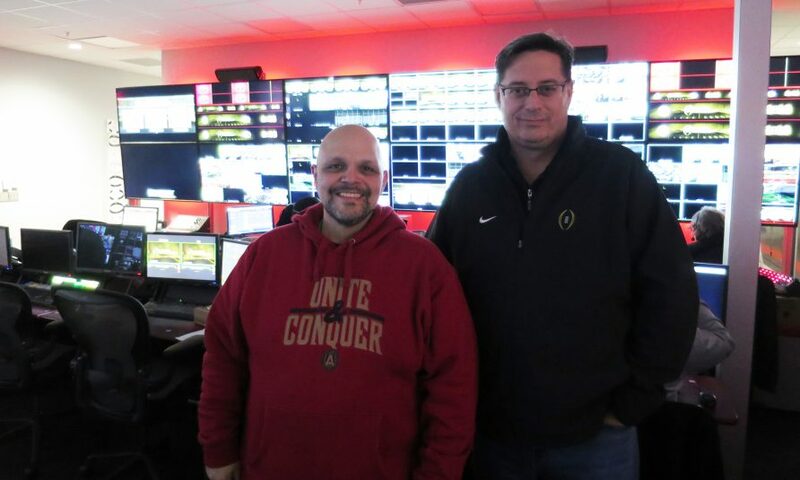 So, when VWSE was faced with working on the canvas of Mercedes-Benz Stadium’s iconic 360-degree Halo videoboard, it helped that VWSE EVP Bob Becker had a long-standing relationship with the man who calls this stadium home, Pete Soto. Mercedes-Benz Stadium’s iconic Halo board measures 1,100 ft. across. The pair were college roommates and actually worked together in helping launch the first videoboard shows for new franchises Florida Marlins and Carolina Hurricanes. Mercedes-Benz Stadium steps back into the national spotlight again tonight when Alabama battles Georgia for the College Football Playoff National Championship, and Becker and Soto will find it hard to keep their eyes off the two spectacular videoboard structures that are groundbreaking in their own right. There’s, obviously, the 360-degree Halo board, which wraps around the interior roof of the stadium and features 63,000 sq. ft. of videoboard space. There’s also, behind the west end zone, a large tower board called the Mega Column, which provides 6,700 sq. ft. of videoboard space and is 101 ft. high. Those dimensions make the Mega Column larger than the primary videoboards at 19 NFL and 24 MLB venues. 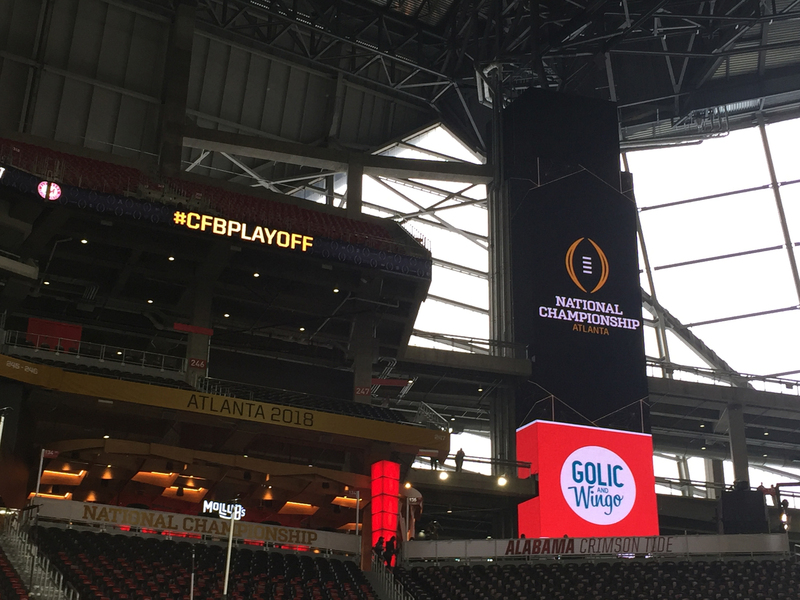 A vertical board called the Mega Column behind the west end zone at Mercedes-Benz Stadium provides 6,700 sq. ft. of videoboard space, is 101 ft. tall, and is used to display everything from stats to social-media integration and player cards. As sparkling and beautiful as the Halo board is, it’s no surprise to anyone who works in this business that it has been a significant challenge for Soto and his team to not only figure out how to program it but to make it work technologically, period. The complexity of the structure led to a stretch in July, August, and September when AMB Sports & Entertainment Group staff plugged away for 77 straight days. So is it worth it to work on these one-of-a-kind boards? Soto sure thinks so. Soto and his team have been very creative is using this new canvas over these past few months. They ultimately settled on splitting the videoboard into four quadrants: over each end zone and over each sideline. For live game coverage, the board is split in half and does a “flip-side” show so that the ball is always going in the direction of the field from which the fan is viewing it. It also offers the opportunity to try things an in-venue video team had never done before. To technologically pull off programming the Halo board, AMB Sports & Entertainment Group turned to at Ross Video, which came up with its high-powered Tessera system. This one-of-a-kind engine enables AMB to link multiple XPression graphics engines to create a scalable matrix of channels to stitch together the images across the 360-degree canvas. The rest of the control room is built around a pair of Ross Acuity switchers and Evertz DreamCatchers (for replay), Evertz supports the routing beneath it all, and the cameras on the field are Grass Valley units outfitted with Canon lenses. Soto acknowledges that designing the control room early in 2017 was difficult given the current state of the industry, but he feels that AMB has set itself up for success.